Raise your hand if you want your child’s brain to turn to mush during summer break (or winter break, or spring break). What? No takers? Phew, that’s a relief. If you want to make sure that your children engage in at least one mentally stimulating activity every day, AND you don’t want that activity to involve more screen time, AND you don’t want it to feel like school work, keep reading for a special freebie I designed just for you. Of course, I will ALWAYS recommend that children read for 10 minutes every day, at the very minimum. It doesn’t matter if children read picture books or novels, cereal boxes or cartoons. Just keep them reading! That said, reading doesn’t happen to be one of the 30 suggestions that I included in 30 Days of Brain Play. Designed to help you keep your child’s brain happy and connected no matter what time of year it is, 30 Days of Brain Play means that you’ll never run out of options. Choose a new brain boosting activity every day, or stick with the same game or theme all week. It’s entirely up to you. The activities are appropriate for a variety of ages and skill levels, and appeal to the kinds of kids who, well, simply like to play! 30 Idea Cards to print, cut and use however you wish (and only if you wish). A complete list of the same ideas, including detailed instructions and links whenever helpful. Heads up #2: This printable is not like the others. It’s 17 pages long! If you decide to print and use the cards (optional) you only need to print the final 5 pages. Printing the remaining 12 pages is also optional. 1) Choose a new activity every day, in sequential order from #1-#30. Then start again from the beginning. 2) Roll a die or dice to choose which numbered activity you will enjoy. Choose one per day or schedule them all in one fell swoop on a calendar. 3) Draw a random Brain Play activity from a hat whenever the mood strikes. 4) Offer your child 3 Brain Play cards to choose from each day. 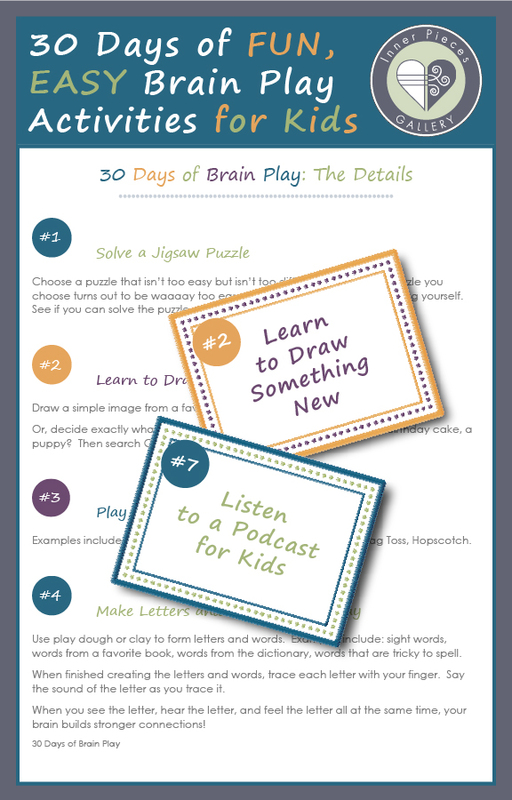 How do you think YOU will use your 30 Days of Brain Play? Your first step is to sign in to The Free Printables Collection and download your summer slide preventing, boredom busting, mush-brain-avoiding list of fun, engaging activities for kids! Not signed up yet? Add your name and email below. Then let the Brain Play begin!